I didn’t anticipate watching Tom Cruise twice in two days. But then I got a call asking me to act in some kind of TOP GUN trailer parody about which I know nothing except that it involves motion capture and that I’ll be wearing a flight costume. Sounds exciting. I said yes, which immediately followed with the realization that I haven’t seen TOP GUN in at least a dozen years. So I watched it again. I watched TOP GUN (1986) on 7.24.14. It was my third viewing of the film, and first since the early 2000s. The script for TOP GUN, written by Jim Cash and Jack Epps Jr., would have a hard time being made in modern Hollywood. It involves the fastest jets in the world, lots of masculinity, and the promise of danger. Yet, somehow, this is more drama than action film. The movie is 95% training and 5% live battle. If this were a comic book movie, it would be like the hero not donning his costume until two hours into a 130 minute movie. That doesn’t make TOP GUN a bad movie by any stretch. In fact, it is refreshing to see an action movie which tries to balance itself with a story. Sure, the story is your basic Spielbergian daddy-issue trope, but the effort works because Tom Cruise (just 24 when this came out) is so immensely likable. The Top Gun school is where the best fighter pilots train. Cruise is the aptly named Maverick, a guy who Can’t Play By The Rules. His major competition is a Iceman (Val Kilmer) a guy who does nothing but Play By The Rules. Maverick’s rear pilot and buddy is Goose (Anthony Edwards), they share a friendship which validates the seriousness their story takes on. Maverick also falls for a girl who happens to be one of his instructors, Charlie (Kelly McGillis). Most of the story centers on three things. 1) Charlie and Iceman flying in training mission to compete for points. 2) Goose worrying that Maverick is too loose with his flying in an effort to validate himself as compared to his fighter-pilot Dad. 3) The Maverick/Charlie love story. All three of these threads work, even if the movie takes its time working through them. There are several surprises, and there is a true change in the character of Maverick. Cruise establishes himself in TOP GUN in a way which he would continue to do throughout his career. He takes a pretty good character and infuses him with the right mix of likability and intensity to be successful in both the lightest and the darkest moments. In some movies he would go surprisingly light (his awesome cameo in TROPIC TTHUNDER). At other times he would go almost entirely dark (movies like COLLATERAL). But you can see the seeds of both in TOP GUN, a movie in which he plays a character that still stands as one of his defining roles. This is also just the second full length feature of any substance directed by Tony Scott. It is not immediately identifiable by the standards Scott would later master. The action is not particularly refined, but more resourceful (they were limited in the number of missiles they were allowed to fire, for example). The score, putting aside its very 80s feel, is used differently, more noticeable and forward. The pop music feels like it is there as a crowd-pleaser, especially in the Great Balls of Fire scene. Yet, even with all that, this is a nicely crafted movie which both defines its era and transcends it. When Maverick and Iceman are involved in a late film battle against some generic baddies, we don’t remember that this movie is nearly 30 years old. We easily get swept up in its grandeur. This is a movie which has maintained a pop-icon status for a reason. It may be a little shallow, and it certainly is musically dated. But this is a fun enough ride with a good enough heart to want to stay on board. 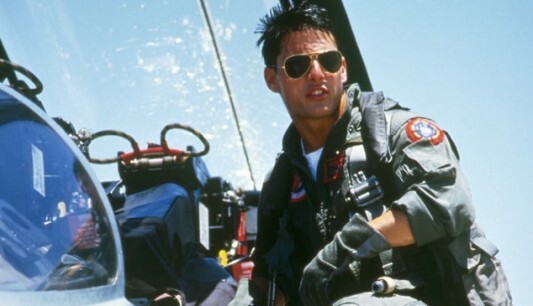 While not a personal favorite, it is easy to understand why so many people love TOP GUN. ~ by johnlink00 on July 25, 2014. You’re only in it for the flight suit… Admit it! Oh I am happy to admit it! Haha.